The leading provider of a broad range of award-winning, digital consumer electronics and home appliance products, Samsung has announced the launch of its new compact 10.2 megapixel digital camera – Samsung HZ10W, which features both Optical and Digital Image Stabilization, and ultra-wide angle 24mm Schneider lens with powerful 10x optical zoom (telephoto capabilities of 240mm – 35mm film equivalent). Face Detection technology detects up to 9 faces and automatically adjusts focus and exposure to ensure better composition and image quality. 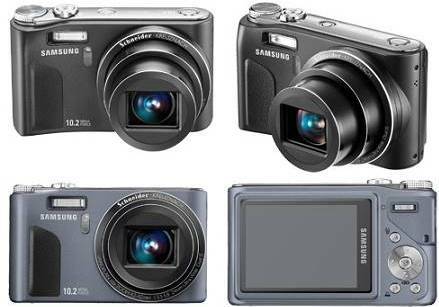 The new Samsung HZ10W digital camera which measures 4.13″ (W) x 2.4″ (H) x 1.4″ (D) and weights 219g is expected to be available later this month at a suggested retail price of $299.99.